The following describes the steps required to add a new DB2 driver to the JReport environment. Download a DB2 driver from IBM. Go to http://www-01.ibm.com/support/docview.wss?uid=swg21363866, select a driver version, and then download and install the driver. Follow the standard DB2 configuration instructions to configure the driver: https://www.ibm.com/support/knowledgecenter/SSEPGG_11.1.0/com.ibm.db2.luw.apdv.java.doc/src/tpc/imjcc_t0010264.html. Add the driver to JReport Designer and JReport Server installations. Locate the JDBC library (for example, db2jcc4.jar) in your DB2 JDBC driver installation directories and copy it to the lib folder in the installation root directory of JReport Designer or JReport Server. Click New > Data Source. 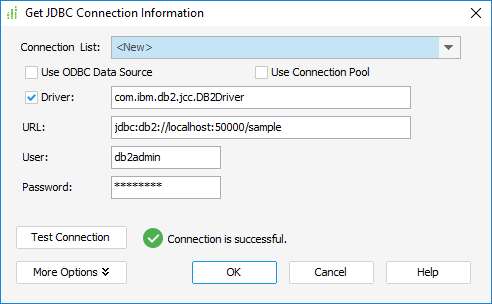 In the New Data Source dialog, select JDBC as the connection type and click OK.
Click OK. You can then access the DB2 database to add tables, views and synonyms to the new data source.